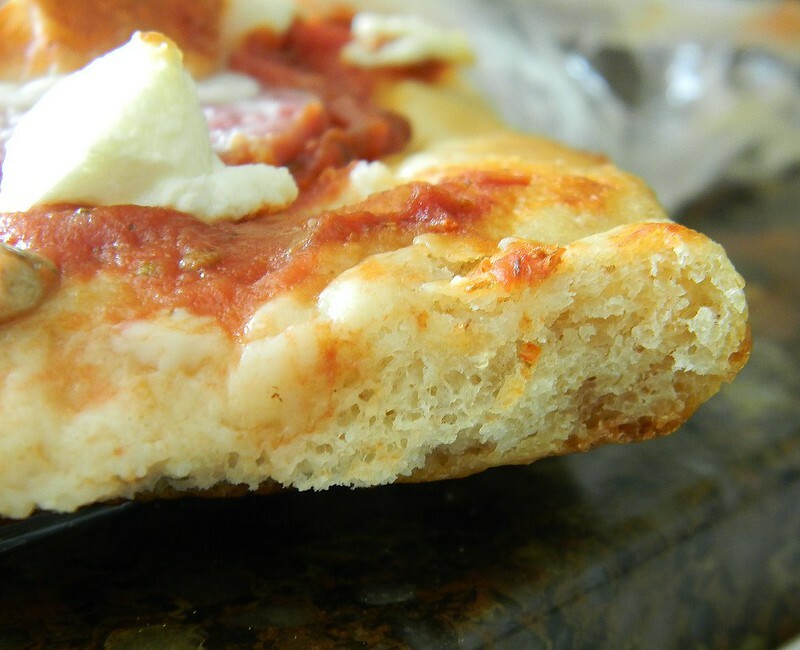 Higher Protein Pizza Dough | What Smells So Good? Pizza. It's one of those foods that is so universal today that it's hard to find a variant that hasn't been capitalized on (or bastardized, depending on your source) in some way, shape or form. Like most people (and all "good" Italians / pseudo-Italians), my family loves their slices, and when we first became a household Friday nights were marked by a delivery guy with 3 boxes in his hands. The small cheese would fall to my sister, who likes nothing else on her pie. One large sucker would go strictly to my stepbrother, who would consume most of it that night (covered in pepper flakes and jalapeno rings) and save the rest for breakfast. Then there was the middle pizza, a marriage of the meat and cheese my stepdad insisted on placing on every pie, and my mom's cravings for something healthier (and vegetable related). Never the same twice (in a row, anyway), I remember mushrooms, assorted peppers, sausage, chicken, feta, olives, tomatoes, bacon and even porchetta finding a home on top of the thin crust mom insists on. While my stepdad sure loves pizza, he's also a Type II diabetic with a chronic problem managing his blood sugar (even when my mom is playing watchdog so he can't cheat). As the disease has progressed with his age and stress levels at work (he now needs insulin), the carb load is even more of an issue, and bumping up the protein and fibre in his relatively white, refined-food diet has been something my mom's been trying to accomplish. While restaurant pizza isn't eliminated entirely, we knew that a homemade version would be more customizable in terms of both taste and nutrition, not to mention be a fun way of breaking in my new baby. For serious low-carbers (like those on Atkins, etc), this is obviously not a "plan-friendly" recipe. I cannot in any way call it truly "low carb" at all - but it is higher in protein and fibre than your run of the mill storebought dough and certainly less preservative-laden than anything you could buy. Not only that, but it has a fantastic flavour profile - just tangy and yeasty enough with a subtle earthiness from the whole wheat and a sweet note from the honey. Making a big batch of this on the weekend is super simple too (even without a professional mixer), and worth it - portions freeze, thaw, par-bake or fully bake beautifully, and now we regularly have at least one ball suited for a 9x13" "thin crust" 'za sitting in the deep freezer for a Friday night splurge. Now if only I can convince my stepdad to try his pizza with ricotta cheese and spinach! Stir together the yeast, water, honey, and whole wheat flour in the bowl of a stand mixer. Cover and let stand for 30 minutes (it will be mostly liquid). Add remaining ingredients to the bowl and knead 8 minutes, adding more flour as necessary to make a smooth, elastic dough (for me this was about 1/4 cup). Place it in a lightly greased bowl, cover the bowl tightly with plastic wrap, and allow the dough to rise for at least 2 hours, or until it has doubled in size. Deflate dough and divide in half. Coat each piece in olive oil (I find it easiest to use a mister) and place in a freezer bag. Freeze up to 3 months. Take dough out 24 hours before planning to bake. Allow to rest at room temperature at least 1 hour before using. Preheat the oven to 425°F. If you're using a baking stone, preheat the oven to 450°F. Divide the dough in half, roll each piece into a 12" round and place on greased pans. 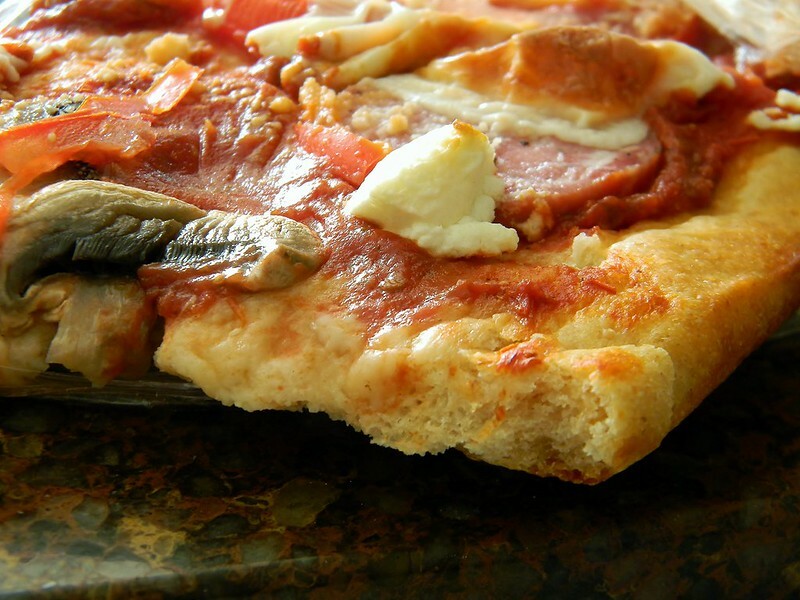 (If you’re using a pizza stone, place the dough on two overturned cookie sheets covered in parchment). Bake the pizzas in the pans for 20 to 30 minutes, or until the top and bottom crusts are nicely browned (for pizza stones, bake for 15 to 25 minutes (leaving the pizza on the parchment)). Follow steps 1 and 2 for "immediate baking", but bake untopped crust 5 minutes only. Cool completely, then wrap in a layer of plastic, then foil. Freeze up to 2 months. Thaw completely before topping and baking for 5 minutes less than above.